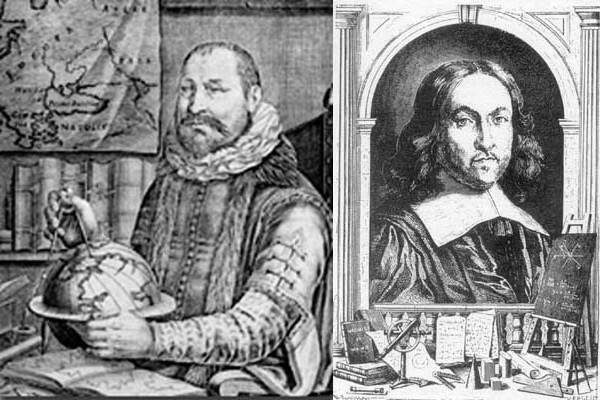 Albert Girard (1595-1632) was a French-born mathematician who studied at the University of Leiden. He was the first to use the abbreviations ‘sin’, ‘cos’ and ‘tan’ for the trigonometric functions. The amount E by which the sum of the angles exceeds π radians is called the spherical excess. This result is called Girard’s theorem. Girard was also the first to observe – in 1632 and without a proof – that each prime of the 4n + 1 is the sum of two squares. In 1640, Pierre de Fermat (1601-1665) claimed that he had a proof of this result. Since the proof was announced by Fermat in a letter to Marin Mersenne dated Christmas Day (25 Dec. 1640), it is often known as Fermat’s Christmas Theorem. where r and s are integers, if and only if p is congruent to 1 modulo 4; that is, the remainder on dividing p by 4 is 1, written p = 1 (mod 4). 5 = 1² + 2² , 13 = 2² + 3² , 17 = 1² + 4² . On the other hand, the primes 3, 7 and 11 are congruent to 3 modulo 4. Clearly, none of these can be expressed as a sum of two squares. To all who visit thatsmaths.com, we wish you a Very Happy Christmas.